One commonality often seen throughout industrial projects is that the equipment used in manufacturing and production can be quite substantial, both in size and maintenance costs. Equipment manufacturers and commercial organizations need a strong and durable solution to common design and building challenges. Many have found that the solution is structural recycled plastic lumber. Cribbing applications support and transport heavy objects during construction projects. Cribbing is used to stabilize heavy machinery and transport vehicles and other equipment. These projects must be durable and not break down under pressure. Using structural recycled plastic lumber is a great alternative over traditional building materials like wood and concrete because it doesn’t splinter or break*. Equipment mats and pallets serve as a lining between heavy machinery and the ground. They provide a bumper that reduces scratching, loud noises and damage to the machinery and the flooring. These applications must be able to withstand huge amounts of pressure and absorb the weight. Structural recycled plastic lumber by Bedford Technology is available in custom shapes and sizes to ensure that your machinery gets the support it needs. Pipe supports protect the pipe from potential stress that could cause damage and leaks and help transfer the weight of the pipe to the supporting structures. Able to withstand heavy loads and extreme temperatures, give your pipes the proper support by using recycled plastic lumber. Speed bumps are ridges on a road’s surface that help regulate vehicle speed, also known as traffic calming devices. Common building materials for these projects include asphalt, concrete and metal. Another alternative that offers durability and strength is structural recycled plastic lumber. Plastic lumber speed bumps are easy to install and are great for newly developed roads because unlike concrete or asphalt, they can be transported and reused. Plastic lumber comes in many color and profile sizes to ensure that your speed bumps not only slow down traffic, but also work with the aesthetics of the area. 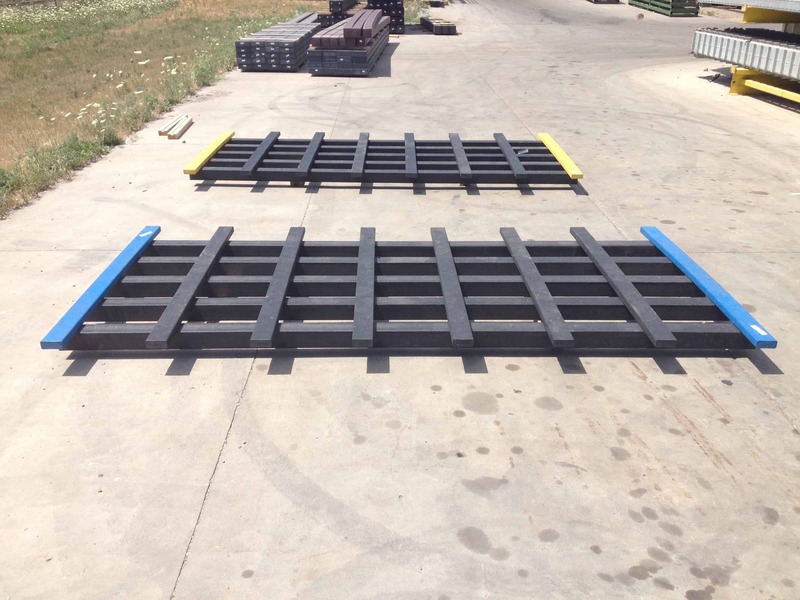 Dunnage secures packages and equipment in warehouses and factories and is often used during transportation and handling. Since the ride isn’t always a smooth one, it’s important that this application is durable, strong and also able to absorb energy from things bumping up against it. Traditional wood can break, splinter and degrade due to mold and moisture. Bedford Technology structural plastic boards are durable and resistant to moisture. Typically constructed of wood and metal, scaffolding is used during construction projects on the exterior of buildings for temporary projects such as cleaning and repairing. Since these structures are exposed to the outside elements, one material requirement should include weather conditions. Wood will rot and break down when exposed to high moisture (rain, snow). Using a building material that is resistant to all types of weather; rain, snow, extreme heat and cold and wind will ensure a safe working environment using structural recycled plastic timbers. Want to Solve Your Production Challenges with Smarter Lumber? Contact us today! We are here to help you along your project journey and will answer any and all questions you may have! Important Update: Welcome to the New and Improved Bedford Technology Website!